For decades, the quail-chick system has been a gold standard approach to track cells and their progenies over complex morphogenetic movements and long-range migrations as well as to unravel their dialogue and interplays in varied processes of cell induction. More specifically, this model became decisive for the systematic explorations of the neural crest and its lineages and allowed a tremendous stride in understanding the wealth and complexity of this fascinating cell population. Much of our knowledge on craniofacial morphogenesis and vertebrate organogenesis was first gained in avian chimeras and later extended to mammalian models and humans. In addition, this system permits tissue and gene manipulations to be performed at once in the same cell population. Through the use of in ovo electroporation, this model became tractable for functional genomics, hence being even more resourceful for functional studies. 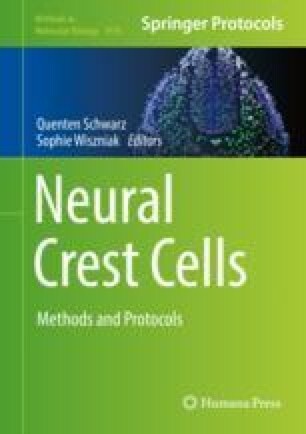 Due to the ease of access and the possibility to combine micromanipulation of tissue anlagen and gene expression, this model offers the prospect of decrypting instructive versus permissive tissue interactions, to identify and crack the molecular codes underlying cell positioning and differentiation, with an unparalleled spatiotemporal accuracy. Moussab Alrajeh and Zuzana Vavrusova contributed equally to this work. This work is supported by the Centre National de la Recherche Scientifique (CNRS) and the Fondation pour la Recherche Médicale (FRM-, DEQ20170839116 grant). MA and ZV are recipients of fellowships from the FRM (FRM-MedicoSci program) and the National Institutes of Health (Richard A. Schneider’s lab, University of California, San Francisco, USA), respectively.